I realize my previous page wasn't very helpful to the person who is just getting started and wants to know which camera to buy, or at least narrow it down to a particular type of system. It turns out there has never been a better time to buy a camera system than right now, and it's only going to get better. A mere two years ago, the only real choice was the DSLR design dominated by Nikon and Canon. Since then, a new breed has been born and is starting to mature - the Mirrorless Interchangeable Lens Camera (MILC). If I were starting over, this is the way I'd go. However, even if I were starting over with the MILC system, I would still insist upon keeping one foot in the world of old-school manual lenses. I would make certain the system brand I buy into would work well with thread-mount lenses, which brings me to my secret weapon... the Soviet made Jupiter series of lenses. That's right - as the rest of the world watches the recent recognition that the Russians had the best rocketry for launching into space all along, I would argue that they've also been making the best optics for cameras for the past 60 years. 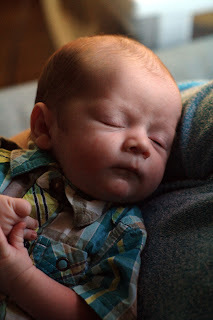 I took the above pic of my newborn grandson with a Jupiter-9 lens mounted via an adapter to my Canon Digital Rebel Xti. I get results with this lens that I cannot get with any other. And getting back to my previous page, it turns out that all the great film shots I did on that Zorki-4 Rangefinder were also through either a Jupiter-3 or Jupiter-12 lens. These lenses are simply incredible for not a whole lot of money. That's one part of it. The other important bit is that the MILC design does away with one of the more pesky aspects of DSLR cameras - the Mirror and Prism assembly. There is an optical advantage to this - without the flip-up mirror in the way, the camera lens can be mounted much closer to the "film" (sensor). It is for this reason that the pics I used to take with the Zorki-4 had a certain look to them, like you could walk right into the picture. As long as the new breed of MILC cameras are made right, this aspect of photography will once again blossom in the digital domain, notwithstanding the $7000 Lieca M9. So while you're doing your homework concerning which serious camera system you're going to invest in, take one tip from me - it's the lens, not the camera that makes the difference.